Legacy FC once seemed to be running neck and neck with the Resurrection Fighting Alliance promotion as one of the top developmental leagues in the nation. However, while the RFA has continued to develop UFC-ready talent, Legacy hasn’t exactly kept up the pace. Its cards have too often featured a mix of prospects who need more experience before they have a realistic chance of signing with the UFC and veterans who are also a long way from receiving a call from UFC matchmakers Joe Silva and Sean Shelby. 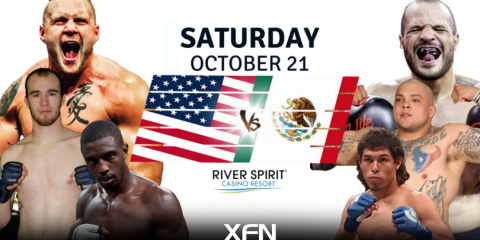 The lightweight headliner of the promotion’s 47th event does offer a glimmer of hope, however, for at least one of the two featured fighters. UFC veteran Clay Harvison has compiled a nice little winning streak since his departure from the big show, and he has a chance to move one step closer to a second stint inside the Octagon when he meets Jordan Rinaldi on Friday night. Harvison has been fighting professionally since 2007. He put together a 8-2 mark before entering The Ultimate Fighter 13 house. Harvison fared decently on the show, advancing with a unanimous decision win over Mick Bowman before being eliminated via a quick choke submission by eventual tournament finalist Ramsey Nijem. 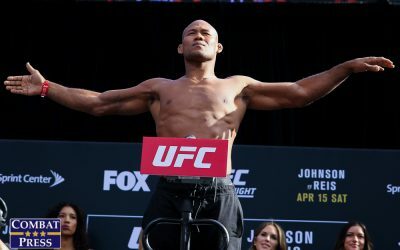 The 35-year-old won his official Octagon debut with a hard-fought split decision over Justin Edwards, but he was stopped in his next two outings against Seth Baczynski and DaMarques Johnson. 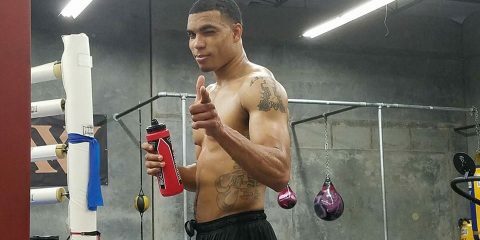 Harvison was handed his pink slip and returned to the regional circuit, where he dropped a split decision to Ronnie Rogers. 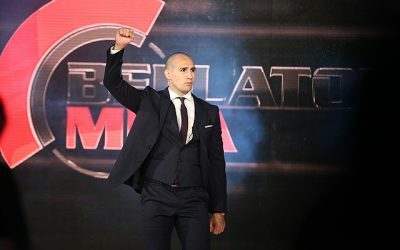 He finally turned things around in 2013 when he finished Ururahy Rodrigues under the Bellator banner and decisioned Ran Weathers at a regional show. 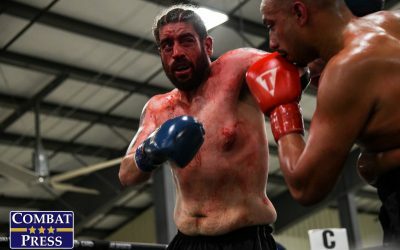 Harvison’s good fortune has continued with a TKO finish of David Lindsey and a unanimous decision victory over Joe Elmore in the TUF alum’s Legacy FC debut. 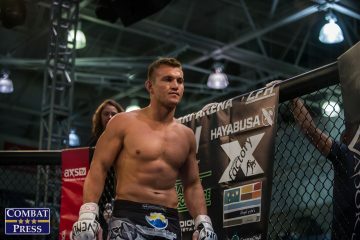 The Madhouse Training and American Top Team product has six wins by way of strikes and four victories via submission. Rinaldi, who made his pro debut in 2010, had his TUF 15 run foiled by Joe Proctor. “All Day” then turned to the next best avenue to the UFC, the RFA. 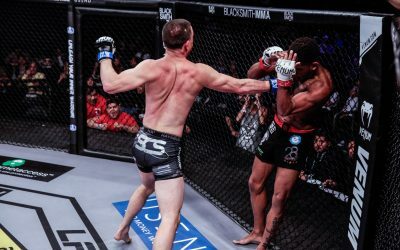 He won his first fight with the promotion, but came up short in his sophomore outing against Jared Downing for the RFA featherweight title. Things only got worse from there for the Team ROC fighter. He lost three of his next four, including two fights under the RFA banner. 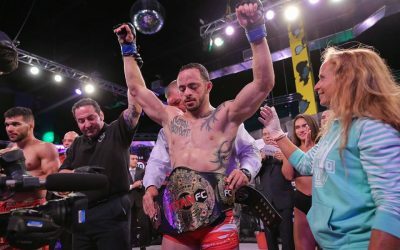 The 28-year-old has turned things around, however, by winning his last three fights, including unanimous decisions over the aforementioned Elmore and UFC veteran Diego Saraiva at regional shows and a submission finish of Soslan Abanokov in the World Series of Fighting cage. The Las Vegas-based fighter has five submission wins and one victory via strikes. Rinaldi has flashed potential — he defeated current UFC fighter Dennis Bermudez early in his career — but he’s also suffered a number of disappointing losses. On a positive note, those defeats have been against fighters who have spent time either inside the Octagon or in the Bellator cage. The bad news? Harvison fits the profile of the fighters who commonly victimize Rinaldi. Rinaldi has a strong wrestling and grappling background, but Harvison is a scrappy opponent who should be able to keep the fight on the feet. Harvison’s worst stretch also came as a welterweight, so he’s grown accustomed to dealing with bigger fighters. Harvison has a far better winning percentage at lightweight, and he’ll add to it with a decision win over Rinaldi. He has defeated accomplished veterans Masakazu Imanari and Yoshiro Maeda. 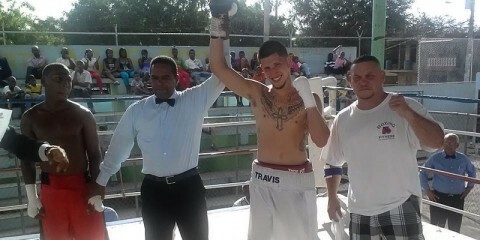 He finished former Resurrection Fighting Alliance flyweight champion Matt Manzanares via strikes. He’s lost and won Deep gold against Tatsumitsu Wada. 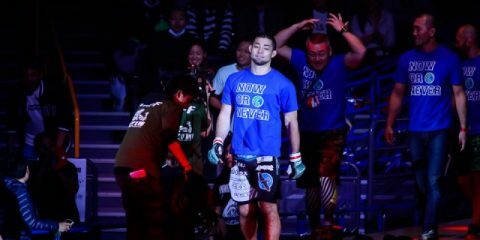 Now, at Deep 73 Impact, Deep flyweight kingpin Yuki Motoya is out to add another notable win to his resume when he puts his belt on the line against Sota Kojima. After a 2010 pro debut loss on the Japanese regional circuit, Motoya entered the Deep promotion. He ended up going 3-3 over his first six fights, but he’s 11-1 over his 12 most recent affairs. He battled his way up the ladder and became Deep’s inaugural flyweight titleholder with a win over Yuya Shibata. After a non-title win, Motoya squared off with the aforementioned Wada in his first title defense. 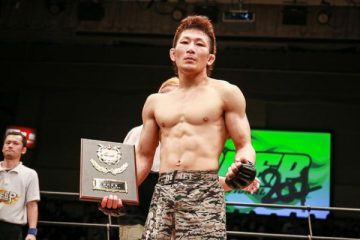 The Club Barbarian Impact fighter dropped the contest by way of a majority decision, but he rebounded with decision victories over Pancrase champ Kiyotaka Shimizu and the aforementioned Imanari and then scored a first-round submission finish of Maeda. The streak was enough to earn Motoya a rematch with Wada. Motoya submitted Wada in the second stanza to reclaim the belt. 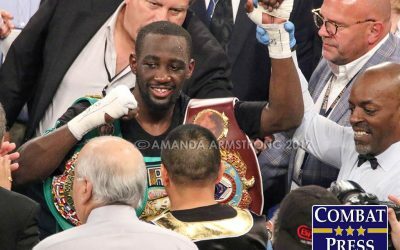 The 26-year-old went on to post stoppage wins in his two most recent fights. Motoya’s well-rounded game has carried him to five striking finishes and five submission wins. Kojima debuted in 2009, just months before Motoya’s 2010 debut, and his early career was just as rocky. The Yoshida Dojo product’s record stood at 3-4-3 after his first 10 fights, and one of those victories had come via a disqualification. The 28-year-old has made a remarkable turnaround in his subsequent 17 fights, going 15-1-1. However, Kojima’s resume lacks starpower. His biggest victories came against Akira Kibe, Junya Kodo and Haruo Ochi. He is a longtime Deep veteran, but he’s also seen action under the Pancrase banner. Kojima is a grinder who has seen the scorecard 20 times and emerged with 13 judge-awarded wins. He has scored four finishes, including two by way of submission, and has been stopped twice via strikes. As a teammate of the aforementioned Wada, Kojima should have some insight into Motoya’s strengths and weaknesses. He still has a tough task in front of him. Motoya is a fiercely aggressive fighter who will eat punches just to throw flurries. 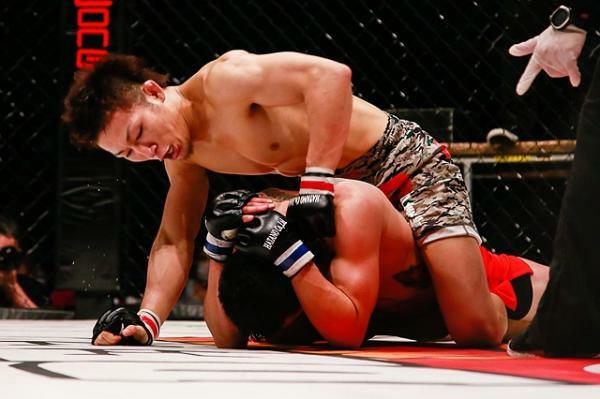 His fight with Maeda was a highly entertaining flyweight affair where Motoya landed in volume during an all-out slugfest, made a slick reversal to take Maeda’s back and eventually finished the veteran fighter with an armbar. He’s not a fighter content to settle for a decision. Kojima, meanwhile, is more than happy to hear from the judges. Those judges have been kind to him over his last 17 outings, but he did suffer a loss to Kota Ishibashi, who was 4-7 at the time, in 2014. 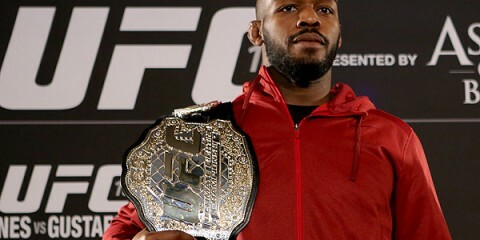 If Kojima cannot consistently defeat sub-.500 fighters, it seems like a lot to ask of him to topple a champion who has established himself as one of the best flyweights not under UFC contract. Against a less aggressive fighter, Kojima might be able to grind out a decision. Motoya, though, is going to be too much for the challenger. The champ is going to throw a barrage of strikes at Kojima if the pair remain standing. If it goes to the mat, Motoya can threaten from the bottom or quickly turn the tables on his opponent with a reversal. Kojima might be able to avoid the finish, but he’s not going to avoid the loss. Motoya will retain the belt. A TKO victory isn’t out of the question for the champ, but he might be forced to settle for a unanimous decision win instead. Aspera Fighting Championship might not have quite the well-known name of fellow Brazilian promotions Jungle Fight and Shooto Brazil, but the organization has brought some significant talent to its most recent cards. Talia Santos was featured just two events ago, and the 24th show included a long list of prospects with impressive records, including the 31-0 Luis Rafael. For its 25th offering, Aspera has brought back Erick da Silva, who was among the prospects featured at Aspera FC 24. 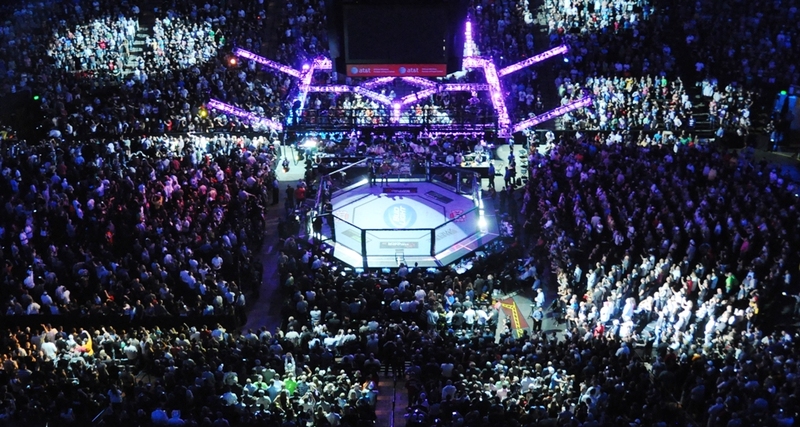 Da Silva will now meet undefeated up-and-comer Josué Vieira in a lightweight headliner. After a 9-0 start to a career that kicked off in 2008, da Silva — not to be confused with the UFC’s Erick Silva, who even shares a similar nickname — experienced a rocky stretch in which he posted a 3-4 mark. 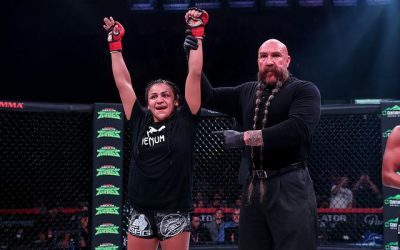 Now, The Ultimate Fighter: Brazil 4 alum is on a resurgence with four straight wins, including three under the Aspera banner. The 26-year-old’s early run wasn’t too shabby. He finished Gilmar Dutra Lima with strikes and followed up with decision wins over future UFC fighters John Lineker and Marcos Vinicius “Vina.” His first blemish came in a submission loss to Nazareno Malegarie, another future UFCer. He went on a roller-coaster ride of wins and losses for the next four years before finally getting back on track in the second half of 2014 and putting together his current streak. “Índio Brabo” has finished all four of his recent victories in the first round, but only one of the fighters, Bruno Lobato, had more than three previous fights under his belt. The Astra Fight Team product has jumped around from bantamweight to featherweight and up to lightweight in his career, and he has tallied four TKO wins and six submission victories along the way. Vieira is the latest prospect to emerge from the Nova União camp. He debuted in late 2012 and has maintained a steady pace of fights, averaging three to four outings per calendar year. He has finished six of his eight opponents, including three vias strikes and three by way of submission. He’s a strong fighter who can drag opponents down with a body lock from the clinch, and he’s quick to advance to mount and work his ground-and-pound, which leads to either TKO finishes or openings for the submission. But, he can be sloppy on the mat. This is a fight that pits experience against size and athleticism. Vieira, who stands 5-foot-11, is a big lightweight who can dominate opponents once he drags them to the mat. He can also make mistakes that cause him to lose position. 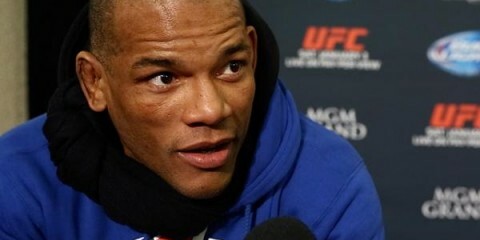 Those mistakes haven’t cost him yet, but da Silva is a huge step up from the Nova União fighter’s previous opponents. He has to be willing to get da Silva down and maintain top position rather than going for armbars that he doesn’t have fully locked up. If he fails, da Silva is sure to capitalize by locking in a submission of his own. Da Silva has posted some big wins, but look at the names on that list. Lineker and Vinicius, his two most notable opponents, have competed as small as flyweight. 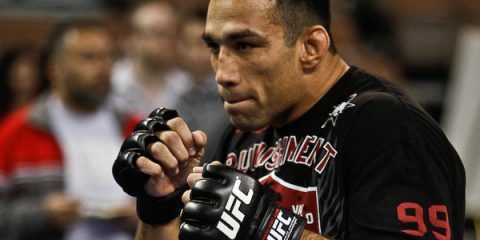 Da Silva has fought and won at lightweight, but he may be better suited for the featherweight or bantamweight division. The veteran fighter isn’t going to be an easy win for Vieira by any means, but Vieira should be able to use his size and strength to get the fight to the ground and work his top game. Da Silva has lost via choke submission on more than one occasion. Vieira is going to add to that total in this fight while maintaining his spotless record.